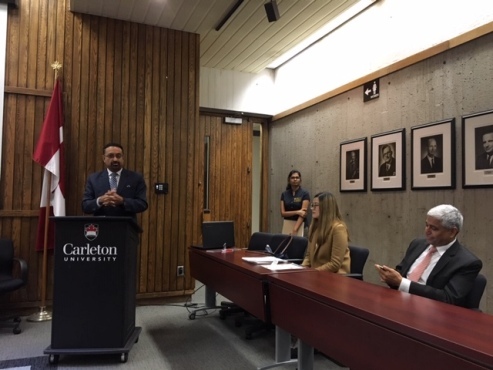 As part of its outreach programme, the High Commission of India, Ottawa in partnership with the Canada India Centre for Excellence, Carleton University organized a get together to welcome the newly arrived Indian students to Ottawa at Carleton University on Monday, 24th September, 2018. 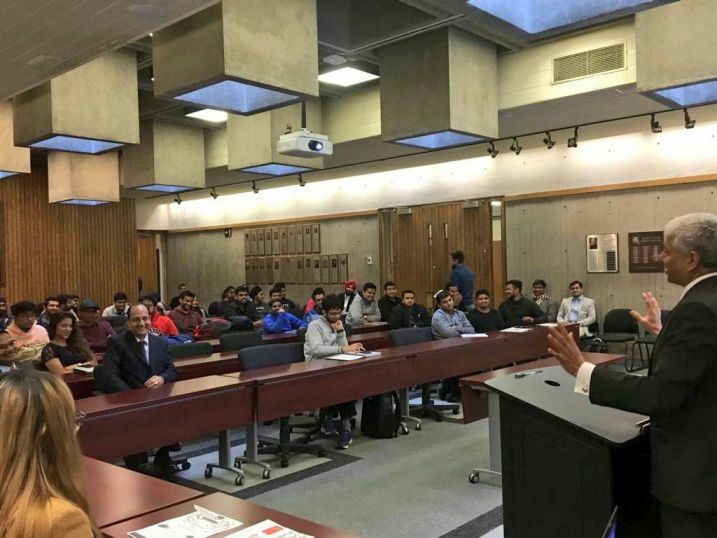 More than one hundred and fifty newly arrived Indian students from Carleton University, University of Ottawa and Algonquin College attended the event. Mr. Harry Sharma, Manager, Canada India Centre for Excellence, opened the meeting and briefed about the Canada India Centre for Excellence at Carleton University. He welcomed the students and mentioned that studying abroad provides a good opportunity to gain social and cultural experience by meeting new people, but also creates loneliness at times which Carleton has tried to address by creating opportunities for students to mix and interact. He briefed them about Ottawa as well as Indian student’s association in Carleton. Mr. Pardeep Merchant, Site Chief of the Division of Neonatology at the Ottawa hospital, Civic Campus shared with students his personal as well as professional experience and described Canada as a land of opportunities. He encouraged them to develop a network of contacts, join organizations which foster the spirit of entrepreneurship, and community organizations which not only organize social gatherings but also inform students about employment opportunities. He also offered the students his personal assistance whenever needed. He also introduced them to Mr. Deval Patel who is running Daily Tiffin Service for the benefit of students who have problem with cooking. Mr. Patel himself came as a student in Canada and is now working full time besides running the Tiffin service in the evenings. 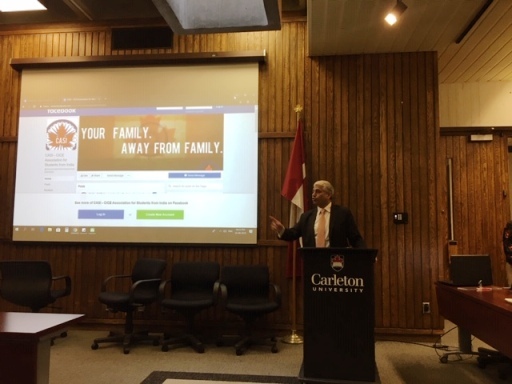 High Commissioner of India to Canada Vikas Swarup in his address warmly welcomed the students to Ottawa and said this meeting was to connect with the newly joining students as all of them were away from their homes. Canada was their new home now and the High Commission of India was their support system. He said Canada was an excellent destination for students as it is an open society and provides good work opportunities and gave the example of various personalities of Indian Diaspora which have risen today to represent Canada as MPs and Federal Ministers, and other eminent personalities which came to Canada as a student and are today heading big businesses. He advised them to be very careful with their passport and to keep it at a safe place and to be extra cautious about the extremely cold winters of Ottawa. High Commissioner requested the Indian students to register themselves with the High Commission online at the Madad portal which has a link on our website. This will enable the High Commission not only to know the number of Indian students in Ottawa, but also assist in extending invites to students for our events and facilitate immediate action in case of an emergency. He talked about the vital role of Indian associations in providing cultural sustenance to the large Indian diaspora and told them about the various Indian associations - like Tamil Sangam, Deshantri (Bengali) association, Gujarati association, Punjabi association, Bihar association, Telugu association to name a few who organise a number of events all the year round and will be very useful for the students to connect with Indian culture and Indian festivals. He said the High Commission was available to assist them 24 X 7 and they should consider the High Commission as their home away from home. In the lively Q&A session that followed, Indian students asked several questions on participation in Indian associations, internship opportunities and consular related issues. The get together ended with light refreshments for all the participants.